This scaled down version of our large Deluxe Presentation Kit is equally as beautiful in appearance and craftsmanship. Each walnut kit box is hand selected, and the components constructed with extreme care and attention to detail. An exceptional value, as well as a welcome addition to any shooter’s den. 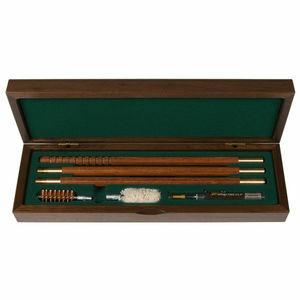 * Three-piece, walnut finished laminated hardwood rod with solid brass hardware. 37" length.